With NFL training camps less than a month away, the oddsmakers in Las Vegas have determined which teams are going to be successful in 2018. Here is the current list of Over/Unders courtesy of the Golden Nugget in Las Vegas. Bills number is right on. It’s hard to say at this point when you don’t know who the quarterback is going to be. We don’t know how Josh Allen looks in training camp either. Training camp should play many of my thoughts out to who will be the QB to start the season and when Allen should take over. The pass rush is the one component of the defense I would like to see in training camp. If I feel that the Bills can get some type of pass rush I might bet the over on that alone. I would think the Bills might have one of the better defenses in the NFL if and that’s a huge IF the can get a consistent pass rush. Bottom line I’ll pass on the Bills pick right now. The Browns have only one place to go and that’s up. After going winless last year the team has a huge upgrade in their roster. Quarterback is the most obvious upgrade. I like both Tyrod Taylor and Baker Mayfield. I don’t care how much either play it’s a major upgrade over last year. The additions of Jarvis Landry in free agency and Josh Gordon off of suspension will give the QB’s two solid receiving threats. Carlos Hyde and offensive coordinator Todd Haley should be an added boost to the offense as well. Greg Williams defense was decent last year and they get the addition of Denzel Ward with the fourth pick in the draft to help. Talent wise this team has the second most talent in their division. Last year was a disaster for the Giants. The overhaul started with the front office. Dave Gettleman was brought in to straighten things out. I like Pat Shurmur as an offensive mind. I thought he got the maximum out of Case Keenum last year in Minnesota. The fact the Giants didn’t go for a QB in the draft I felt was a mistake. That being said I love Saquon Barkley and he should help Eli Manning immensely. Health was a huge issue last year. Odell Beckham, Landon Collins and Janoris Jenkins were injured last year. I think Eli Manning still has a year or two left in the tank and getting this team to seven wins is likely. Not a fan of the Raiders bringing back Jon Gruden. Seems like a money grab to me and I’m not convinced his heart is in it. I didn’t like what the Raiders did in the draft going for OT Kolton Miller in the first round. I think Miller is a project that will struggle in his first year. The Raiders didn’t do enough to help a bad defense. In spite of having Khalil Mack this defense hasn’t been ranked above 25th as a NFL defense. I think the Raiders will be the worst team in the AFC West so getting to 9 wins will be extremely difficult. The writing is on the wall for Joe Flacco. This should be his last year with the Ravens. I’ve never been a huge Flacco fan, so I think at some point this year the Ravens turn the ball to Lamar Jackson. I believe the Bills and Ravens are very similar teams. I don’t understand why the Ravens over/under is 1.5 games higher than the Bills. The Ravens won’t get two easy wins over the Browns this year. Schedule wise they play the tough NFC south. I think they go 1-3 against that division. The Ravens big offensive free agent signing was WR Michael Crabtree. I never thought he was a number one receiver. The offensive weapons around Flacco again are less than exciting. 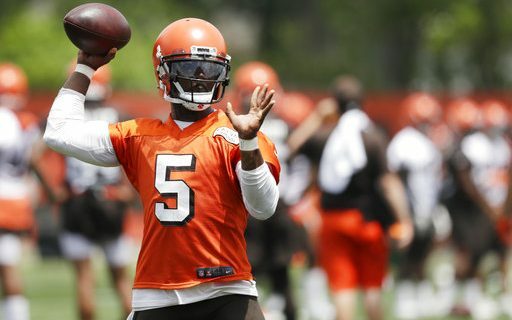 Check out Bob’s over/under picks for rookie QB starts.